Posted June 1st, 2013 | News. As part of its on-going commitment to quality and development, Soundcraft has joined the BWF. The British Woodworking Federation provides a voice for the industry and works with government on changes and revisions to building regulations, industry standards and specifications. The BWF provides advice and support to their members along with a range of benefits to make sure Soundcraft are best placed to continue to deliver quality products and exceptional service to its customers. Just two of the recent regulatory changes in the industry have been the introduction of the EU Timber regulations in March, to ensure legal and sustainable timber. And, on the 1st of July the mandatory requirement for CE marking for windows and doors comes into force. As legislation and standards change to further ‘professionalise’ the joinery industry it has never been more important to be a BWF member. What impact has the new EU timber regulations had on procurement of timber doors and windows? Posted May 20th, 2013 | Regulations. March 2013 saw the introduction of the new EU timber regulations to prevent illegal timber being sold in the European market. Since the implementation of the scheme companies involved in the timber and timber product supply chain must have either, introduced systems to ensure compliance, or ensured that the systems already in use are compliant. Posted March 20th, 2013 | Fire doors. Buying a fire door that has been tested to either BS 476 or EN 1634, and manufactured under a recognised 3rd Party Certification Scheme, but allowing anyone to install it, is like buying a car manufactured under mandatory national or international standards, with all the safety features required, and then letting someone without a licence drive it. Can those safety features, in themselves, be expected to prevent an accident? Posted March 7th, 2013 | News. Having invested in machinery and extensive training, Soundcraft has received its first two orders for Hybrid composite products, with a combined value of c£150k. The orders, from Higgins Construction and Lifebuild Solutions, are for the manufacture and installation of composite or alu-clad windows, doors and curtain walling, based on the SAS Hybrid system. The orders are for two schools, one in Teddington, Middlesex and the other in Farnham, Surrey. These orders include items from the Hybrid Series 1 composite casement window and door system, the Hybrid Series 2 composite window system (with slimmer sightlines), and the Hybrid Series 3 composite curtain walling system. Of particular note is the height of curtain walling – over 7 metres – on one elevation at the Lady Eleanor Holles School at Teddington. This requires several bespoke laminated, engineered timber beams, at 7200 x 360 x 50mm, to be manufactured in PEFC certified softwood. In addition, bespoke fixing brackets have been designed by Soundcraft to cater for specific project requirements. Hybrid composite products have impressive U values and thermal performance, and are designed to meet, and often exceed, building regulations. They are manufactured in the UK at Soundcraft’s North Kent factory, and are often available in surprisingly short lead times. Posted February 19th, 2013 | News. Soundcraft is two thirds of the way through completing the re-instatement and installation of over 3000 fire doors and doorsets for Kingston University in Surrey, across many of the University’s teaching and residential sites. The works on the project, valued at c£800,000, are being carried out in accordance with BS8214 and the requirements of Exova BM Trada’s 3rd Party Certification Schemes for the Installation and Maintenance of Fire Doors. New doorsets, which are 3rd party certified, are mostly laminate faced, either FD30S or FD60S fire rated, in singles and pairs. Specific attention has been paid to ensuring compliance with the University’s strategic access and equality policy, with particular emphasis on complying with the requirements of the Equality Act 2010, the DDA and Part M. In some cases new glazed timber screens have been installed, incorporating pairs of doors. Work is scheduled to be completed in the Spring of 2013. Posted February 18th, 2013 | News. Soundcraft has been appointed by a local Surrey (Ashford & St Peter’s) NHS trust to supply and install FD30S and FD60S, laminate faced, fire rated, pairs of doors and frames. Valued at £130,000, the doors will be installed over four floors in the Abbey Wing of St Peters Hospital in Chertsey, Surrey. The doorsets will be manufactured under the Exova BM Trada 3rd Party Certification Scheme for the Manufacture of Fire Doors. Installation will also be 3rd Party Certified, under the respective Exova BM Trada Fire Door Installation scheme. Work will start in March and will take place in occupied wards and communal areas. Consequently, health and safety considerations will be paramount. Soundcraft has considerable experience (in both general hospitals and mental health units) of installing doorsets in occupied NHS buildings, which will prove invaluable for this project. The specification satisfies the requirements of the Equality Act, incorporating the DDA, and Approved Document M (Part M). Hospital environments can be demanding and any damage to the doors could result in the fire resisting integrity of the doorsets being compromised. To deal with this problem, Soundcraft’s doors for this project will be fitted with protective cladding to minimise the risk of damage. As a matter of course Soundcraft provides maintenance advice in O&M manuals at the end of contracts. In this particular case the advice will be based on the requirements of BS8412 and the Exova BM Trada 3rd Party Certification Scheme for the Maintenance of Fire Doors – a scheme of which Soundcraft is a founder member. Posted February 13th, 2013 | News. Steve Rouse, Soundcraft’s long serving sales manager is leaving on 8 February and retiring to his house in France. After successfully promoting the company and its performance door and window products for many years Steve is looking forward to the change of scenery and culture. He joined Soundcraft in the 1990s and has been involved in product development and promotion throughout. In recent years Steve has been instrumental in the successful launch of the Integrity Range of Secured by Design (SBD) steel communal security doors, which complement the traditional steel and timber portcullis communal security doors ranges that have successfully served the social housing market for decades. In addition, Steve has pioneered Soundcraft’s move into 3rd Party certified fire door manufacture, installation and maintenance, all under the respective Exova BM Trada schemes. As specification requirements for 3rd party certification for fire doors are increasing his initiative in this area is proving fruitful, particularly with a number of significant contracts for the health sector, where Soundcraft’s extensive range of laminate faced fire doors is frequently specified. Steve’s commercial successes have not been confined to doors alone, as he has achieved consistent results in gaining specifications for fire and acoustic glazed timber screens and conservation windows, both box sashes and casements. His departure will trigger a re-organisation within Soundcraft’s sales and marketing operation to ensure that all his good work continues to produce positive results. Posted February 9th, 2013 | News. Soundcraft has been appointed by Vinci Facilities to replace, repair and upgrade over 1500 traditional timber box sash and casement windows in the six blocks of the Samuel Lewis Buildings at the Liverpool Road Estate, London, N1; part of the Southern Housing Group. Valued at c£1.2 million, the project is a good example of Soundcraft’s ability to manufacture and install high quality timber windows that match existing, to satisfy conservation and heritage requirements. The buildings are over a century old and are in a conservation area. Consequently, the new windows will have to replicate the existing 100 year old sash windows in every detail. Most of the new windows will be box sashes, using traditional weights, not spiral springs. Single glazing will be puttied in place, with brass ironmongery to match the original. New windows will be manufactured at Soundcraft’s North Kent factory, whilst on site workshops are being established to enable re-glazing and upgrading of existing sashes to take place. Work was started in February 2013 and is scheduled to carry on into 2014. Posted January 4th, 2013 | News. One of London’s grandest Victorian buildings, the Grade 2 listed HQ of the Royal College of GPs, recently underwent a major refurbishment to create a new state-of-the-art conference and event centre which opened in November 2012. Situated in Euston Square, the refurbishment included a requirement for conservation acoustic windows in the form of secondary glazing, to minimise noise from the London traffic on the busy Euston Road. 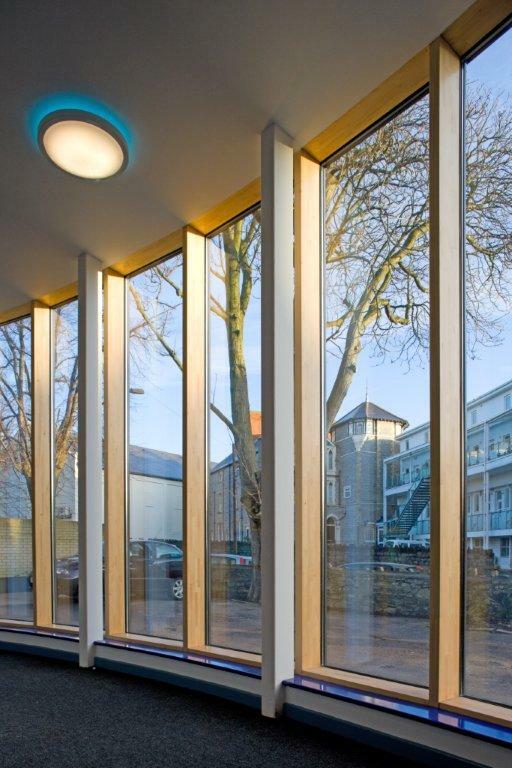 The windows were designed, manufactured and installed by Soundcraft, working for main contractor, Structuretone, in a contract valued at over £120k. The challenge for Soundcraft was to achieve demanding acoustic performance whilst matching the design of the existing windows in every detail, including ironmongery. To meet the minimum specified acoustic performance, with an upper limit of 47dB, Soundcraft arranged for testing at BRE to confirm that their design met the required level of sound attenuation. 49dB was achieved in the tests, carried out in accordance with BS EN 20140-10:1992 and ISO 717-1:1997. In addition to acoustic windows and glazing, Soundcraft was able to manufacture and install, in a short lead time, a number of traditional casement conservation windows, again matching the originals, to assist in completing the project.